The Garifuna people of Roatan celebrated their annual festival this year in Punta Gorda. Here is a recap of the event. The Garifuna people have lived in Central America since April 12, 1797. They speak the Garifuna language. Most speak English today as well as Spanish. Most of the Garifuna people live along the coast of Honduras in places like Trujillo, La Ceiba, Tela, Puerto Cortes and other costal towns. 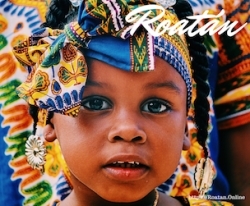 Roatan Online is dedicated to promoting the culture of Roatan, online. And this year, our very own Garifuna's threw a party in Punta Gorda. Few things give a culture pride as does heritage and few embody heritage as do the Garifuna people of Roatan. This year, Roatan Online went down to Punta Gorda, Roatan to record the annual festival. Our aim is to bring our viewership closer to the Garifuna's culture by providing them with images from the event along with a highlight video. The United Nations Education Scientific and Cultural Organization (UNESCO) proclaimed the Garifuna language, music, and dance a Masterpiece of Intangible Heritage of Humanity in Honduras, Belize, and in Nicaragua. The first Garifuna Summit was held in 2005 in Corn Islands, Nicaragua, with the participation of many Central American countries. Los "Garifuna" (/ɡəˈrɪfᵿnə/ gə-rif-uu-nə);(pl. Garinagu in Garifuna) Are mixed-race of descendants. The Garifuna are a mix of people from West Africa, Carib Islands, and Central Africa. Known by British colonial administrators in the early days as "Black Carib" and "Garifuna" so that they could be distinguished from "Red" or "Yellow" Caribs which were the original Amerindian population before intermixing with Africans. It is believed that the Black Carib or Garifuna are descendants of the Igneri people. The Igneri became residents of the Lesser Antilles, present day St. Vincent, Trinidad, and Dominica. The Garifuna people have a variety of music in addition to Punta. They also have hungu-hungu, combination, wanaragua, sambai, and Paranda among other. Paranda is showcased in the video found in Roatan Online's Roatan Blog. Highlight Video of Roatan's Garifuna Festival.